Pantone launch the Colour of the Year for 2001 is Fuchsia Rose 17-2031. Drastically different from the pervious years colour Cerulean Blue, Fuchsia Rose PANTONE 17-2031 is much more exciting, and will appeal to everyones feminine side. Brighter, stronger, sexier, that's Pantone's colour message for 2001. 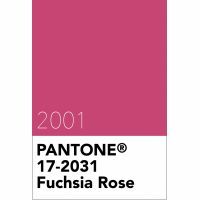 Fuchia Rose 17-2031 is from the Pantone Fashion, Home + Interiors colour library. Pantone CMYK Reproduction: Not available.